You are here: Home / Ent. / Film Review; An Acceptable Loss. Film Review; An Acceptable Loss. (ThyBlackMan.com) Nothing about An Acceptable Loss screams, “Pay $12 bucks for me at the theater because I’m worth it.” This isn’t an artistic breakthrough (Roma). It doesn’t expand the thriller genre (A Quiet Place). The drama on view is never deep (Leave No Trace). The ensemble performances won’t win prestigious awards (The Favourite). 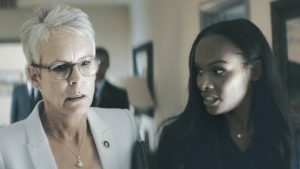 The screenplay by writer/director Joe Chappelle (TV’s Chicago Fire, CSI: Miami,The Wire) pulls in some topical political themes, adds touches of suspense and revenge, but the storyline never amounts to anything extraordinary—and neither does the direction. Joe Chappelle models the Libby character on former Secretaries of Defense Robert McNamara and Donald Rumsfeld, architects of the Viet Nam and Iraq wars respectively. In hindsight, the former admitted to his blunder. The latter never took responsibility for a bogus war over weapons of mass destruction that didn’t exist. Chappelle starts with an engrossing premise with far-reaching political implications. As a TV series director, his instincts are solid. As a theatrical filmmaker he’s unable to pan out his style and intuition onto a broader canvass.